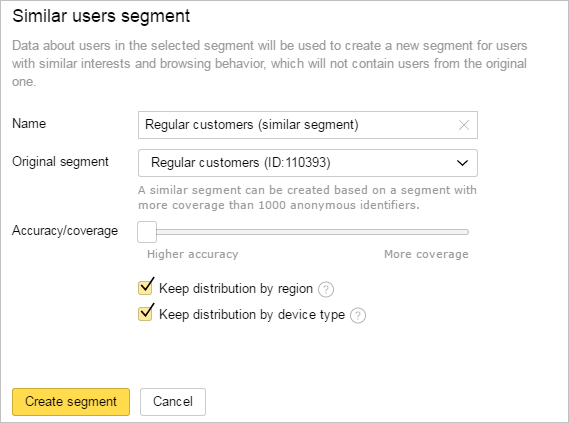 You can use only one of your own segments to create a similar users segment. You can't create similar users segments based on segments to which other Yandex.Audience users have given you access. In the Segments tab, click Create segment and choose Derivative segment → Similar segment. Alternatively, click in the row for the source segment and choose Similar users segment. Enter the name for your new segment and choose which original segment you want to use. Yandex.Audience will select users with similar interests and Internet behavior based on the user data from your original segment. Users from your original segment will not end up in the new segment. Decide how similar the users in the new segment must be to the users in the original segment. Remember: the better the users in the segment you create match the users in the original segment, the fewer cookies will be added to the created segment. By default, the distribution of users by city and device type in the new segment will be close to the original segment. For example, if in the original segment half of the users were from Moscowand the other half from Saint Petersburg, then in the new segment there will be same distribution of users by city. If you can't find users keeping the original distribution, Yandex.Audience will select the most similar users regardless of the city or device type. To find users in any city or with any device, turn off the relevant options. The segment you create will be assigned the “Processing” status. Processing time depends on the settings you selected and will take at least two hours. If the audience coverage is at least 1000 anonymous IDs, the segment gets the “Finished” status. You can now use it to configure your ads.